Early october, when Shetland wool Week was in full swing, I dove into my stash to find the perfect yarn to knit it (Gilliatt from DE Rerum Natura) : it was my way to participate, at least by mind and kniting, to this event I really wish to attend one day ! 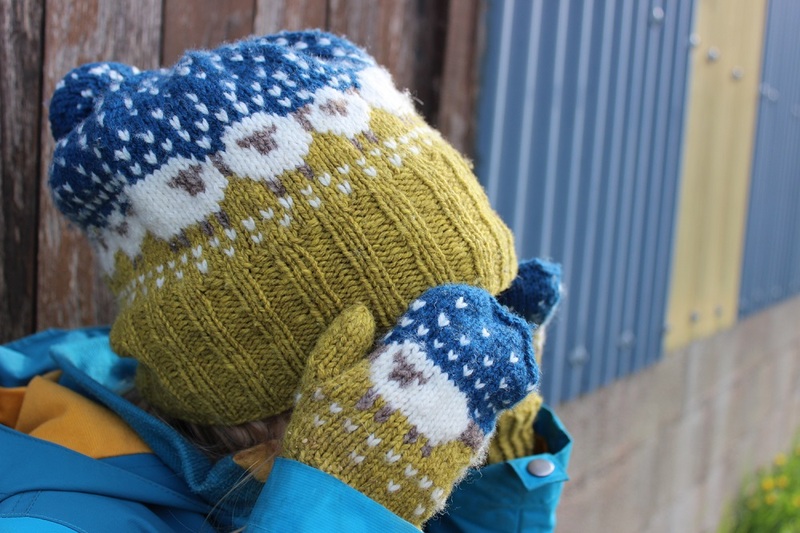 This hat was a fast knit, and a fun one too : seeing little sheeps appears, for a knitting and yarn fan, is super attractive ! I really liked the finished product, but hte hat was a bit small for me… Not a problem ! My little girl liked it too and she just needed a hat to keep her ears warm when going to school… She adopted it ! So, I quickly knitted her a pair of mitts. And because I really love those little sheeps, I decided to add some on them… My girl is happy, and so am I !